This Kershaw Zero Tolerance Rick Hinderer model 0561 is about as perfect as a knife can get. 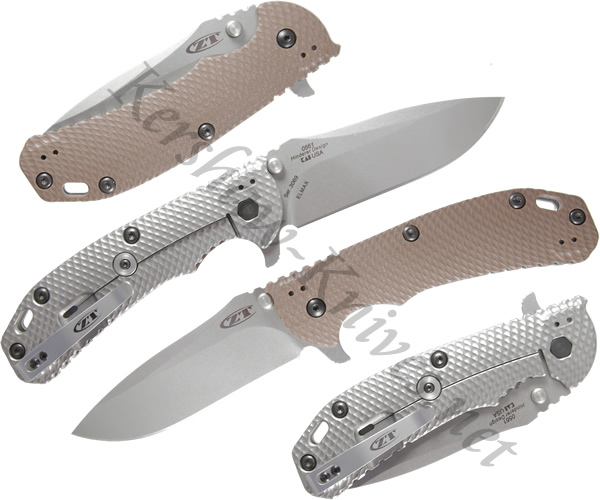 With a desert sand colored G10 grip on one side, and a machined titanium grip on the other, this knife looks cool and unique at the same time. The pocket clip on the handle is able to be mounted on four sides: left, right, tip up, tip down. The blade is made from a material called ELMAX wish has high resistance to wear and corrosion. The blade is opened using either the ambidextrous thumbstuds or the flipper on the spine. Inside the hinge of this knife is roller bears which help the blade open smooth and fast.